Why do these talentless "singers" try to be what they aren't? And what is good about being a convicted felon? APRIL 16--In the hip-hop world, a performer's street cred can often be gauged by the number of entries on their rap sheet, the time they have spent behind bars, or the gritty details of their illicit escapades. By any of those metrics, the chart-topping R&B singer Akon appears to have compiled an exemplary outlaw resume, one brimming with scrapes from a hard knock life. Compared to most of hip-hop's leading figures past and present--50 Cent, Snoop Dogg, Eminem, Diddy, Tupac Shakur, Jay-Z, Notorious B.I.G.--Akon, 35, seems to have logged more time behind bars and, consequently, gained a better understanding of the average convict's plight (both in and out of custody) than any of his musical peers. The New York Times has referred to him as the "prison-obsessed R&B singer" who "wants it known that crooners can evoke prison life just as effectively as rappers." In fact, the singer not only named his company Konvict Music, but he settled on "Konvicted" for the title of his second album, which sold nearly three million copies last year. As it turns out, however, "Kontrived" might have been a more accurate choice. 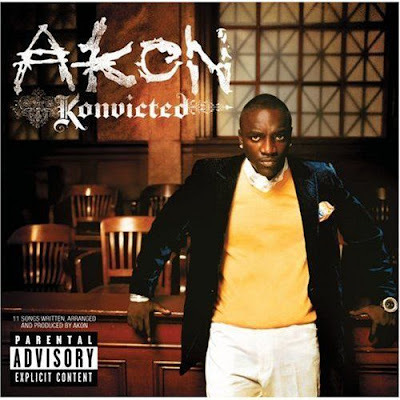 Akon's ad nauseum claims about his criminal career and resulting prison time have been, to an overwhelming extent, exaggerated, embellished, or wholly fabricated, an investigation by The Smoking Gun has revealed. Police, court, and corrections records reveal that the entertainer has created a fictionalized backstory that serves as the narrative anchor for his recorded tales of isolation, violence, woe, and regret. Akon has overdubbed his biography with the kind of grit and menace that he apparently believes music consumers desire from their hip-hop stars. Akon's manager, Robert Carnes, declined to discuss any aspect of the criminal history of the R&B singer, who is currently touring in Africa. Carnes directed a reporter to Sharonda Smalls, Akon's publicist at Universal Motown Records. After being apprised of the nature of TSG's story, Smalls said she would seek replies to our questions, but had not called back at press time. Darrick "Devyne" Stephens, Akon's longtime collaborator and business partner, did not return several messages left at his Atlanta office. Akon is not the first performer to fudge some biographical details. But few artists have gone so far out of their way to aggressively promote these fabrications and embellishments (or you could just call them lies).